If you enjoy running and can manage 10 kilometres, then why not get on your running shoes and support us by entering this year’s 10K! 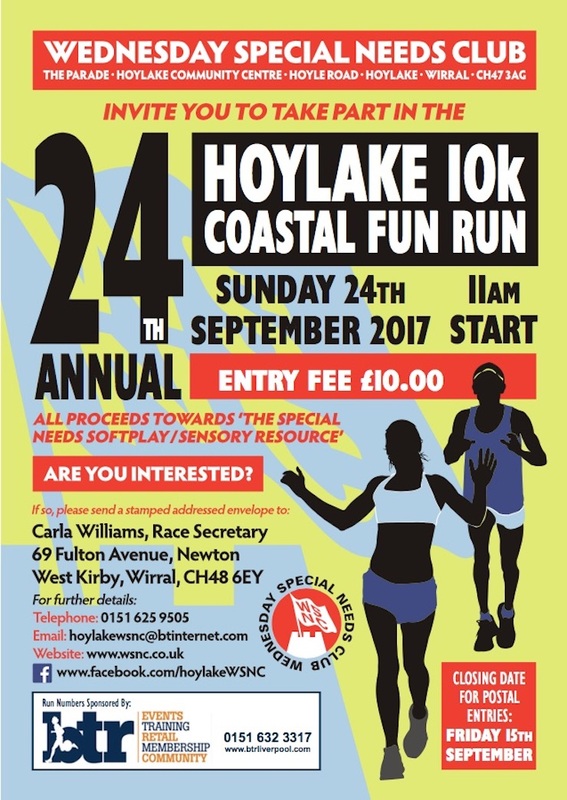 We really need do need your support, and by taking part you will be supporting a locally based special needs club, the Wednesday Special Needs Club which is based at Hoylake Community Centre, and who organise the 10k. All the funds raised from the 10k, goes towards the club’s Sensory Softplay Resource which is open 5 days a week for special needs of all ages, this special resource is funded, maintained and run by volunteers from the club. The run starts opposite Hoylake Community Centre, proceeding along the sea front on North Parade promenade, dropping onto the Meols embankment for a short distance, then joining the rangers’ coastal trail, through the car park by Leasowe Lighthouse (drink station) and back onto the embankment towards Leasowe Castle Hotel (the 5k marker). Runners then return back along the same route. The course is reasonably flat with markers and marshals at every km. It costs £10 to enter. Runners receive a commemorative T-shirt and certificate on completion.